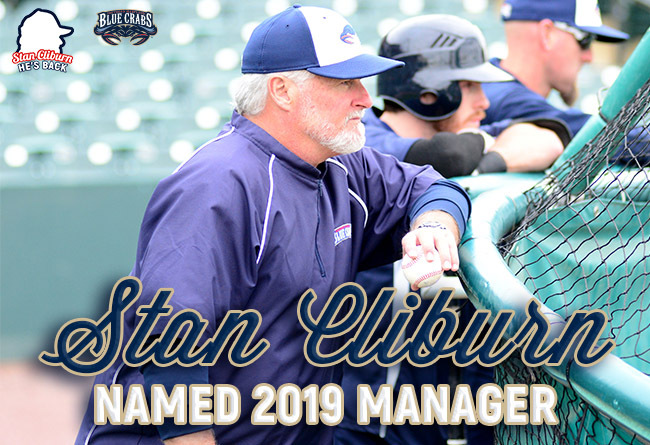 (Waldorf, Md., Oct. 19, 2018) – The Southern Maryland Blue Crabs announced today that Stan Cliburn has been named the Manager for the 2019 season. Cliburn returns to Southern Maryland for his second stint, leading the Blue Crabs to a Freedom Division Championship during the 2015 season. Cliburn began his baseball journey with a 14-year professional playing career. He was drafted by the California Angels in 1974, working his way to the majors in 1980. The catcher then spent the next five seasons with the Pittsburgh Pirates organization, before finishing his playing days with the Angels and Atlanta Braves organizations during the 1986-87 seasons. The Pirates came calling again in 1988, but this time in a new role as Cliburn was named Manager for the Watertown Pirates of the New York-Pennsylvania League. He spent four years managing in the Pirates organization, before heading to the Texas Rangers AA affiliate Tulsa Drillers for two seasons in 1993-94. Cliburn then headed to independent ball for the first time, spending five seasons with the Alexandria Aces of the Texas-Louisiana League, and winning 55% of his games with the team and back-to-back league championships in 1997 and 1998. After a successful first stint in the independent leagues, Cliburn got back to affiliated ball in 2000 when he joined the Minnesota Twins to manage the single-A Quad City River Bandits. He worked his way up the Twins organization, spending five years with the AA New Britain Rock Cats and then four seasons with the AAA Rochester Red Wings. Across his 16 seasons in Minor League Baseball, Cliburn amassed 2,613 games as a Manager, winning 1,321 of them to record a 51% winning percentage. In 2011, Cliburn returned to the independent leagues, this time joining the Sioux City Explorers of the American Association for three seasons. After spending one season as the bench coach for the Lancaster Barnstormers, Cliburn returned to managing at the start of 2015, joining the Blue Crabs staff. This move brought great success for both the manager and the organization, as Cliburn guided the team to their first Freedom Division Championship. The team made the Atlantic League Championship Series for just the second time in their history but were defeated in four games by the Somerset Patriots, coming up just short of their first league title. During the 2015 campaign, Cliburn picked up his 1500th win as a manager during his career. After his successful debut in the league, Cliburn moved back to New Britain for the 2016 season, being named the first manager in the history of the newly-founded New Britain Bees franchise in the Atlantic League. He spent two years in New Britain, before joining the Chicago Dogs coaching staff in 2018. Cliburn served as the bench coach, under former Blue Crabs Manager Butch Hobson, for the American Association’s newest team.